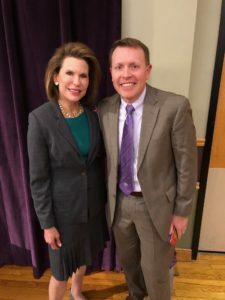 Kansas State University’s School of Leadership Studies and the Women of K-State initiative partnered together with the Cancer Center of Kansas to host Susan G. Komen Foundation’s Founder, Nancy Goodman Brinker, on Tuesday, October 30th, 2018. During the visit, Brinker served as a keynote speaker at a special Women of K-State luncheon on-campus. After her remarks, a panel of medical and other area professionals, including CCK’s own Dr. Jeremy Deutsch, facilitated a discussion regarding the importance of wellness. With a room filled of over 300 guests including faculty, staff and students, the panelists and guest speaker highlighted women’s wellness, specifically in the Manhattan community. This event is said to have been a time focused on hope for women, hope for their future wellness and hope for those who may be experiencing struggles of wellness. For the full story and a video recap visit the WIBW News here.